Contrast training develops power and speed for football. Learn the basics and get 5 sets from STACK Expert Danny Takacs. Contrast training is a form of resistance training that pairs a heavy strength exercise with a lighter power exercise to take advantage of a phenomenon called post-activation potentiation. Post-activation potentiation refers to the acute enhancement of muscular contractions due to the contractile history of the muscles and central nervous system. In simpler terms, the heavy loading of the strength exercise generates a high degree of central nervous system activation, which results in greater power output during the following power exercise. As a result, contrast training is a great workout for developing power and speed for football. For the transfer of power to take effect, the paired exercises must be biomechanically similar. A Barbell Bench Press combined with a Box Jump will not produce the desired training effect; however a Barbell Squat paired with a Box Jump will. The following contrast sets should be done after a proper warm-up and before any other lifts. Limit yourself to a maximum of two contrast sets per workout. Rest 10 to 20 seconds between contrast exercises and two and five minutes between sets. The strength exercises should be heavy but not maximal. Pick a weight that allows you to leave two or three reps in the tank each set. Do 3-6 sets of 3-5 repetitions for each exercise. 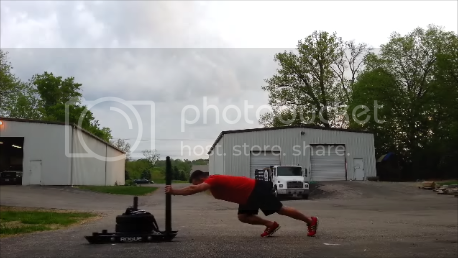 For the sled work/sprints, keep the same number of sets but do only one push/drag/sprint for 10 to 20 yards. With your feet about hip-width apart, grasp the barbell with an overhand or over/under grip outside your knees. Keeping your chest up and back flat, fully extend your hips while keeping the bar close to your body. Grab a light to moderately heavy medicine ball with your elbows straight and palms facing each other. Keeping your chest up and back flat, perform a quick counter movement by hinging at your hips. Immediately fully extend your hips to throw the ball overhead as high as possible. With dumbbells at your sides and your rear foot elevated on a bench, squat while keeping a straight back and tall chest. Push through your heel to extend your front knee and hip back to starting position. Standing on one leg, perform a quick Counter Squat and immediately extend your knee and hip to jump straight up or onto a plyometric box. Try to land as softly as possible. If you are doing the Box Jump, start with the smallest box and work your way up. With a shoulder-width grip, hold a barbell resting across your shoulders. Quickly dip down into a quarter-squat, keeping your weight on your heels. Forcefully drive up and push the barbell overhead. Return to the starting position and repeat. Holding a medicine ball at chest level, execute the same dip and drive as the Push Press and throw the ball overhead as high as possible. Load a sled with a weight that's challenging to drag for 10 to 20 yards. 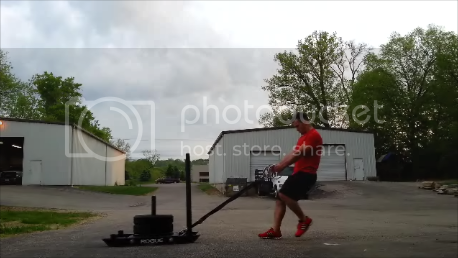 Using handle attachments and keeping a good upright posture, drag the sled backward. Keeping a good athletic position, implement a backpedal drill for 10 to 20 yards. It can be a straight backpedal, a backpedal into a lateral movement, etc. Load a sled with a weight that's challenging to push for 10 to 20 yards. 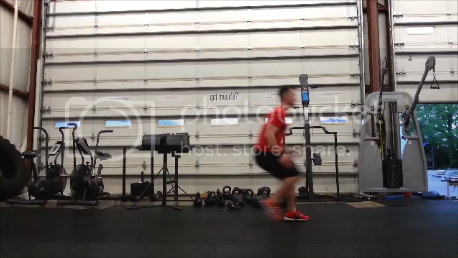 Push the sled forward, keeping your elbows straight and your back flat. 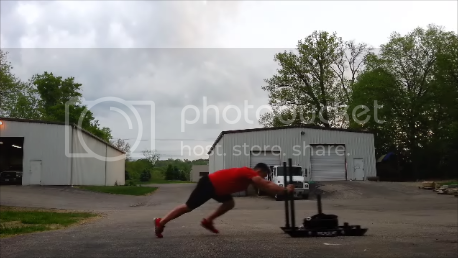 Using the same sled you pushed, lighten the load to a weight that will allow you to sprint 10 to 20 yards.